When you hear the word “engineer” who do you imagine first? Chances are a woman is not the first person to pop into your head. That’s because the engineering profession is the field where women are underrepresented the most. The education and research movement to include women in the engineering workforce has improved the diversity of the field slightly, but there is still quite a bit of work to be done in order to close this gap. Engineers are making significant advancements in society, but to better all of society, we need a female perspective. More and more women are entering the engineering field, so in this blog let’s learn a little about some of the first female engineers in the world. 1876: Elizabeth Bragg – First woman to receive a Bachelor’s Degree in Engineering – University of California at Berkeley. Troy Eller English, a researcher for the Society of Women Engineers, found that it was rare for even one woman a year to receive an engineering degree nationwide from 1876 until 1900. The percentage of engineering degrees awarded to women did not reach one percent until 1972. Let’s take a closer look at the University of Michigan, a leader in the movement to include women in the engineering field. The first woman to receive a degree in engineering at the University of Michigan was Mary Helger in 1882. There was not another woman engineer until 1895 when Marian Sarah Parker graduated with a degree in Civil Engineering. A century later, in the year 1994, University of Michigan College of Engineering ranked third in the country in its percentage of female engineering undergraduates with 25 percent. A year later in 1995, over 30 percent of first-year students in the college of engineering were women. This is the highest percentage of the college’s history and nearly twice the national average at the time. 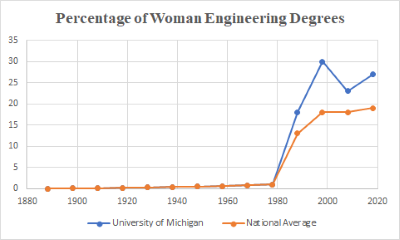 Here are the trends in the percentage of engineering degrees awarded to women for both the nation and the University of Michigan. While the increase of woman receiving degrees has grown, the averages have been decently stagnant since 2000. 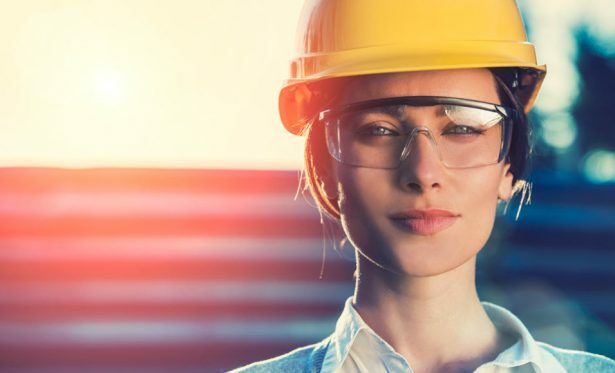 While women continually are closing the gap in fields such as business, law, and medicine, there is still a great divide in the engineering field. To this day men are receiving more than 80% of all of the engineering degrees nationally. Although the number of female engineers today has dramatically improved since the early 1980s, when only 5.8% of engineers in the U.S. were women, the numbers are still surprisingly low. Today only 11% of practicing engineers are women, according to the Congressional Joint Economic Committee. All of the efforts channeled towards getting girls to study science, technology, engineering, and math (STEM) have increased graduation rates. However, there is a setback that has not been widely addressed, once women make it into the field, they often leave. One in four female engineers leaves the field after age 30, according to the Society of Women Engineers. This is not due to a lack of intelligence or talent but rather the fact that engineering is such a male-dominated profession that you often need to blaze a trail for yourself to succeed or be taken seriously. The harsh reality is that in the professional field there is still the mentality that men know more about technical things, even unconsciously people turn to men. It is a hard task to break down stereotypes that people have grown accustomed to. The most crucial step in changing the engineering field is to start with the mentality of the children we’re raising. It is generally found that children begin losing interest in math and science by the age of six. If young girls are taught to give up on a passion because the environment they live in says that it’s a boys job, the engineering field will never improve in diversity. However, some steps are being taken to try to remedy this problem. Some organizations are pushing young girls to stick with their passions for science and math. For example, Girls Who Code is an organization that encourages and teaches girls about computer science. To highlight a current strong engineer changing the field, let’s take a look at Debbie Sterling. Founder and CEO of the company called GoldieBlox. The concept of GoldieBlox is to create not only a toy but a brand where young girls can grow up learning how to design and build things. The face of the brand is a young golden-haired engineering girl that you get to create an adventure with. Sterling is working on transforming the toy aisle and is a leading voice in the movement to encourage girls’ interest in engineering and technology. Engineering is not about being a born genius it’s about how much you want it and how much effort you put in. A diverse set of minds needs to be working on the world’s often growing problems. As a society, we are largely missing out on women’s intelligence, creativity, and values in solving these problems. If women present themselves with confidence and pride, they will show everyone that female engineers are essential to the improvement of this world. Madison Bryce is a sophomore at the University of Michigan. She is studying mechanical engineering with a minor in computer science. Madison has four years of CAD experience and joined the Fisher Unitech team to share and grow this knowledge. 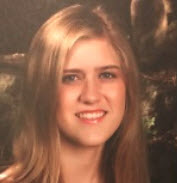 Madison is a Certified SOLIDWORKS Associate (CSWA), Certified SOLIDWORKS Professional (CSWP), and a Certified DriveWorksXpress Associate. Madison’s dream is to one day become a roller coaster engineer. She is currently in a theme park engineering group at the University of Michigan. Fisher Unitech is improving manufacturing in America by delivering, supporting and training customers on the best product development software and additive and subtractive manufacturing solutions available. The company delivers 3D software and hardware, which enable customers to design, validate and manage innovative products from prototyping to manufacturing. With more than 17 office locations throughout the Midwest, Mid-Atlantic, and New England. For more information, visit www. FisherUnitech.com.